Shirleen Allicot has the latest details. NEW YORK (WABC) -- A family from Queens has turned the mantra to 'serve and protect' into a family affair. 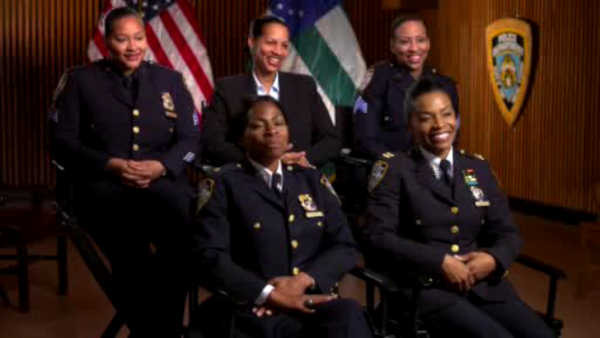 The five Holmes sisters, all members of the NYPD shared their story with Good Morning America's Robin Roberts on Monday. Deputy Chief Juanita Holmes is one of the highest-ranking women in the NYPD, overseeing the Domestic Violence Unit. "I'm the second oldest, but the oldest girl. So I was left, you know, braiding their hair, helping them with their homework, cooking at a very early age, and I realized that God was preparing me for something bigger and better," Juanita says. Her sister, Captain Janice Holmes is the first African-American female commanding officer of her precinct. Are the two sisters competitive with each other? "Yes, and I'm winning!" Janice says. The younger sisters, Estella and Selena are both Sergeants. All of the sisters were inspired by retired Sergeant Bernice Holmes. "A lot I would give to a good friend of mine - Charlie Divine. He used to say, 'you have such a way with people, and yet they warm up to you, and I really thing you should take this test with me'," says Holmes, "and I just went on in, and I took the test. Passed with flying colors." The sisters grew up in Queens with thirteen brothers and sisters. Now, more than half of the siblings have careers in law enforcement. "I think it's a good thing when you can leave a legacy of positive role models who the children and people in general in our environment that were raised in can say, you know, 'they were no different than me, and look what they achieved'," says Selena, "it's a mindset. If you think big, you can be big. If you think small, you can be small."